It is of no surprise that the first principle of our national philosophy (Rukun Negara) is Belief in God. Religion does play an important part in the lives of many Malaysians. Even if one is an atheist, the issue of religion will still crop up when he dies in deciding which religious last rites should be performed. Most of all, regardless of whatever religious beliefs we hold, all religions teach us to do good. While the British used religion as a tool to defeat the communists during the Malayan Emergency by building temples and churches in new villages, religion today can be the solution in our battles against crime, corruption, moral decadence, and a rampart against any attack on the institutions of marriage and family. But, sadly, little is written about the role and societal contributions of the clergy – simple men of God of various religions – who join a profession which often does not bring about worldly wealth or fame. After all, they should store up whatever treasures they have in heaven and not on this earth. Yet many believe that clergymen have an easy life. They do not realise that the majority of them make huge sacrifices both in their personal and family lives and, at one stage or the other, in their ministerial service, some may have even considered calling it quits. It is a fact that the majority of them are overworked and poorly paid. Of course, we should not compare them with those who serve in mega temples and churches such as the New Creation Church in Singapore which recently revealed in its last financial year report that the church paid its senior pastor S$500,000 (RM1.2mil)! Neither can the majority of the clergy whose work is hardly recognised be compared with the few whose work have been recognised with a Datukship or Tan Sriship. Hence, it is always a moot point as to what extent should the clergy be remunerated and the level of recognition be accorded to them. Here, the Muslim clergy are remunerated by the State Islamic Religious Department, but the non-Muslim clergy such as Christian ministers still depend mainly on the collections received from the laity. But to say that the clergy should live in poverty and a life as poor as a church mouse is wrong. This reminds me of a heart-wrenching story narrated by a Christian writer, Toby Awasum, whose conscience was pricked when his young pastor died suddenly from a heart attack. 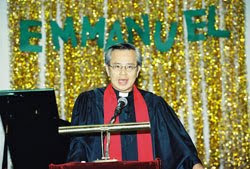 It was in 1986 that this young and charismatic pastor who was a lawyer joined his church. The pastor not only owned a house, but had his own cars and a PhD. He gave all that up to move to his state to pastor Toby’s church. By the middle of his third year, he had exhausted all his savings, lost the new home he bought, and could barely support his family. Three years later, at the age of 35, he had a heart attack and died instantly. After his death, his desperate widow and children had no choice but to move back into her parents’ home hundreds of miles away and received little or no support from “her church family”. Ironically, the pastor had left his church financially healthy, and it is pathetic to note that while his church was busy stuffing its bank account, the church had miserably failed in its responsibility to care for the welfare of its pastor and family. On the other hand, it cannot be gainsaid that the expectation of the clergy to lead an exemplary life according to his faith is high. A clergyman who does not exhibit Godly virtues in the manner in which he speaks and conducts his life can be a huge let-down to the lay believers. But those who have become an inspiration as an encourager and role model to their lay believers and society ought to be overwhelmed with appreciation and love. It is, therefore, apposite to record my own appreciation to my pastor, Rev Nicholas Yeo, who retired last Thursday after more than 35 years of faithful service. It must be acknowledged that the depth and breadth of Yeo’s impact on the lives of many who came to know him is testimony of the Godly life which he leads and a role model which he plays as an exemplary pastor to his colleagues as well as a religious patriarch to his congregation. In appreciation of his services, the Church will hold a special retirement service and appreciation dinner for him and wife Lee Swee Keng at New York Hotel, Johor Baru at 5pm this evening. To this wonderful couple who have been a great inspiration to many, we wish them happy retirement and many, many more years of good health and happiness. May God bless them.